Ridinger, Johann Elias (Ulm 1698 – Augsburg 1767). Trace of a Marten / Fore Paws / Hind Paws / Trace of the Weasel / Little Fore Leg / Little Hind Leg. Pine marten in slightly apocalyptic tree landscape looking down at the weasel on the ground. Below the picture the life size traces detailed a-c and d-f resp. Etching and engraving. (1740.) Inscribed: 19. / J. E. Ridinger inv. del. sculps. et excud. Aug. Vindel., otherwise in German as above. 14⅞ × 11¾ in (37.7 × 29.7 cm). REPRESENTATION OF THE FAIR GAME 19. – Thienemann & Schwarz 181; Stubbe, Ridinger, 1966, pl. 20; Ridinger catalog Darmstadt, 1999, III.29 with illustration; Sälzle, facsimile ed. of all drawings for the set, 1980, pp. 58 f. (dated 1739). – Posture of the weasel and the lower part of the marten’s tree modified as against the preparatory drawing from 1739. Uniquely beautiful impression with watermark WANGEN as one of the sturdy laid paper qualities preferred by Ridinger. – Margins above & below 3-4.9 cm wide, on the left 1.3, on the right 0.6 cm margin resp., each in addition to the wide white platemark. – Acid-freely backed margin tear laterally lower left still extending into the white platemark. Faint age spots in the lower margin. from 1911, Hoberg-Jansen 144 with illustration. For already his painting “Playing Weasels” from 1911, preceded 1909/10 by the lithograph of the same name, betrays the knowledge of several Ridinger coppers from entirely different sets. Marc shows two weasels, of which the one in the tree, bowed over a bough, looks down upon the one sitting in raised attitude on the ground. The trees besides of an eccentricity which he uses in this ostensible density in the painted œuvre only in the two “Acts below Trees”, H.-J. 143, of the same year. For the thematic initial spark Ridinger’s small-sized sheet “The Weasels” (Th. 479) from 1740 as sheet 89 of the set Design of Several Animals stands. Here, too, two of them playing, yet both on the ground and in an utterly different context. The latter Marc split up. And took the attitude of the two animals from sheet 86 of the set, the two pine martens Th. 476 (here additionally available the companion piece with the two beech martens Th. 475 plus the original printing plates to both). The young one of which hangs across a bough of equally low height as with Marc and looks down at the mother standing on the hind paws against the trunk luring with a captured bird. “Playing Squirrels” as sheet 88 (Th. 478) shows the same situation, only with the difference of a further one in the tree, too, but keeping a little aloof and not involved in the play. 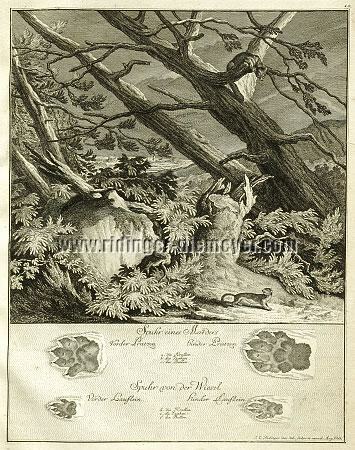 Yet the bizarre tree – and as such also Sälzle characterizes it expressly in his 1980 edition of the preparatory drawings of present set – as rather rare also for Ridinger he took from present sheet of the “Trace of a Marten / Trace of the Weasel” with the same attitude of the marten in the tree and the, however, neutrally shown weasel on the ground. – – – The same in shining, yet less wide-margined impression rich in contrast: trilaterally narrow margin and upper right trimmed to platemark on 6 cm resp. Margin below 3-3.5 cm wide. – On back above remains of glue strip from previous mounting in boards.